Today I made Soondubu Jigae for dinner! This is within my top five favorite foods, so I can be a little harsh of a critic. However, this turned out decent. Good enough for me to recommend people do what I did (watch this video). The recipe is two parts, both important. You need to make the broth exactly as she does in the video (I hypothesize, I need to make another batch with crappy broth as a control test). The rest you can guesstimate. 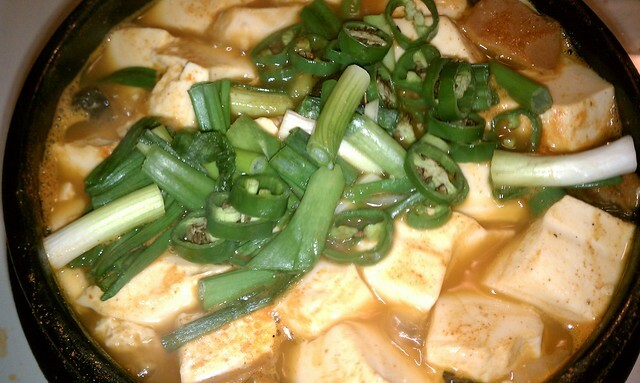 For those of you who do not parler-en-korean, Soondubu Jigae is “spicy tofu stew”. A lot of restaurants call it “tofu casserole”, however ‘E’ and I agree that this is not a good description and has probably disappointed many midwestern white americans with high LDL who wanted nothing more than a good low cholesterol substitute for their mother’s tuna casserole. This is nothing like tuna casserole! Comparing Soondubu to tuna casserole is like comparing the wisdom of Christ + Amida Buddha + Q (from Star Trek) to …to a …. to a tuna casserole! What’s wrong with my tuna casserole? This stew look yummy.